In this first ever edition, the newly appointed Peace Commissioner names the ‘Best XV’ players he played with at both club and county level. 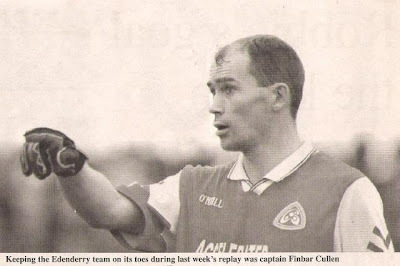 Cullen enjoyed a largely successful playing career including four senior county medals, captaining Offaly to the 1997 Leinster title, a National League title in 1998 and he also represented Ireland on many occasions in the International rules series. There are a total of eight clubs represented with the 2013 Edenderry GAA Hall of Fame recipient opting for six of his fellow Edenderry club mates. There are two representatives each from Tullamore and Rhode with Doon, Ballycumber, Gracefield, Ferbane and Shamrocks making up the remainder of the team. 1: I’m picking Donal O’Neill as my number one because he was an all round brilliant goalkeeper who had a fantastic kick-out. 2: I’m going with Cathal Daly at corner back. Cathal was a deserving All-Star recipient in 1997 and one of the fastest defenders I ever seen. 3: If the ball went in over my head, there was a 90% chance Adrian Murphy would win it. He was so reliable and I just felt extremely comfortable knowing he was behind me. 4: To complete my full back line I’ve chosen Kevin Guing. I always just referred to Kevin as Mr Dependable. You knew what you’d get when you lined out with him and that’s a great thing to have in a team. 5: My number five jersey goes to John Kenny. John was a fantastic skilful player. He was great going forward and a great reader of the game. 6: I played with Michael Óg Brady for a number of years and he was such an intelligent footballer. He had great knowledge and was a terrific reader of the game. 7: My final defensive position goes to Tom Coffey. He was extremely strong on the ball and a great passer of the ball. Again, Tom was a great reader of the game and it is such a vital attribute to have. 8: For the midfield number eight jersey I’ve chosen Padraig Dunne of Gracefield. 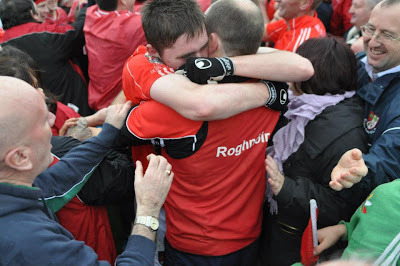 Padraig was a great fielder of the ball and was such a huge presence on the field. He was also a huge leader for both club and county. 9: As Padraig’s partner I’ve chosen Ronan Mooney. He had a great engine and is one of the most mobile men I’ve ever seen. He covered so much ground both going forward and defensively. 10: At left half forward I’m going with Ballycumber’s Colm Quinn. He was a great man to win his own ball or pick up the loose ball and he had a fantastic left foot too. 11: The first name on every team sheet was Sean Grennan. Every team needs a Sean Grennan that’s all I can say about him. He was tough as nails and just so honest. He wasn’t the most naturally skilful player but I can’t think of anyone I’d rather go to battle with. 12: I only got to play one year with my right half forward but I knew Niall McNamee was going to be special. I played with him on his debut in Portlaoise and my gut feeling was right as he has been the main man in Offaly for over twelve years now. 13: At number thirteen I’ve chosen Vinny Claffey because quite simply he was a nightmare for corner backs to mark. I’ve always been a big fan of his. He could win his own ball and was so fast. He was very physical for his size too. 14: My full forward is my club mate Declan Farrell. He was one of the most intelligent players I’ve ever played with and just so honest. His distribution was second to none and he was a good score getter too. 15: To complete my team I’ve gone for Peter Brady. Who else? He had the sweetest left foot I’ve ever seen. He was the ideal corner forward. He had great hands, he was deadly accurate and he was just so intelligent. Next week the legendary centre back will reveal the 'Best XV' footballers he played against throughout his career.